A while ago I showed you this bench. My dad made it for me back in the late 80's or early 90's. I was big into the country look at that point, so I asked him to put that oh-so-cute heart cutout in the back. Fast forward 20 years (yikes...am I really that old?) and I'm not so into the country look anymore. 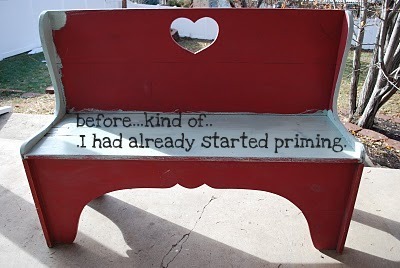 But the bench is sentimental... and I wanted to use it. First, I painted it a fab aqua. (Milk Pail by Marth Stewart). But darn it! There's still that cutesy heart cut out. Then I remembered this wall hanging/plaster-plaque-replica-thingy (that's the technical term) I had in my decor stash. And it was just the right size to cover that heart cutout. So I painted it out in Milk Pail as well. Then I performed a bench to plaster-plaque marriage ceremony which consisted of attaching the plaque to the bench with a couple of wood-screws (it already had hanging holes on its back.) Just hung it on there and VOILA! 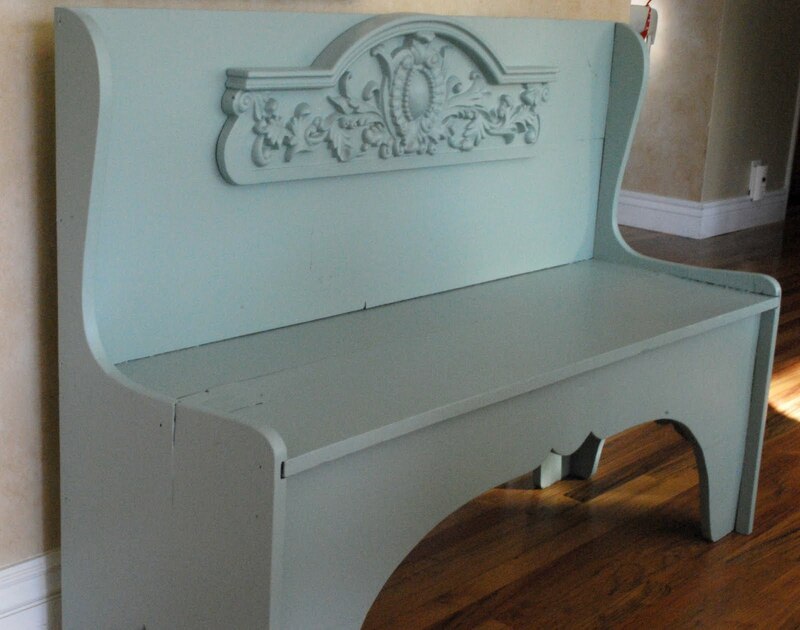 A French-ish beauty of bench! This pretty little bench will be sitting under the silhouettes I shared yesterday. Anyone guess yet what that area is going to be? 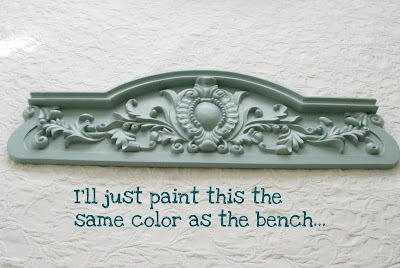 That is a really pretty color and a great solution for an out-dated country look! French is definitely better! What a great idea! it really updates it from that dated country heart look (I knew it well!). Love the colour too! Problem solved and looks great to boot. Not to be a Debbie Downer but how does it feel on your back? Doesn't matter too much, we women always sacrifice style for function with everything! (Shoes anyone.) The bench is usually a quick sit or for bags and such, your scrolly is the perfect cover up. oooh, GREAT idea! What a great way to update a common "country" style! Super job! OMG What a difference! Love the color! Oooohhh, LOVE, love, love! 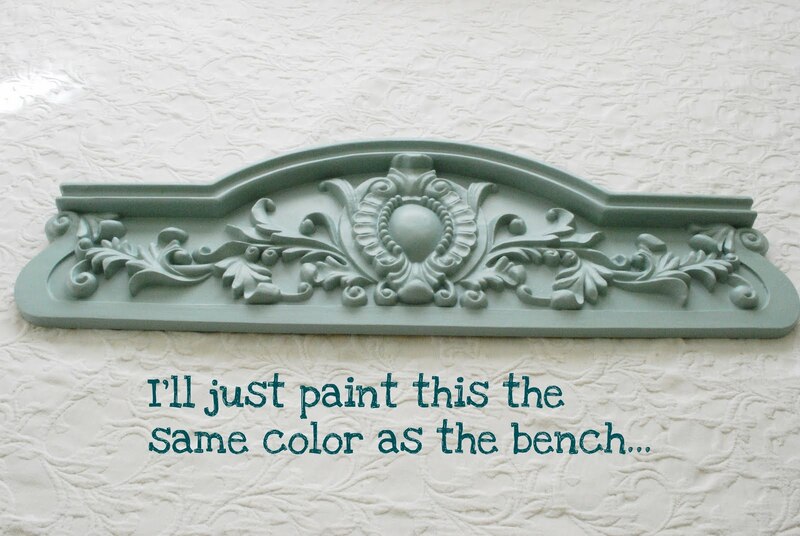 I need some of that color in my house! That is seriously beautiful. Good job. I have a baby crib that my grandfather made me for my american doll with that cutesy heart and I hate it now so I might have to tackle the bed and make it look a little different! I wouldn't have thought to cover up the heart cut out, just would have walked on by if I'd seen it! Great idea! I love the way it turned out. Would look awesome at the foot of my bed, too. Mud room or maybe laundry? That applique just makes it! That color is great too...bye, bye little heart! What a great idea, I always find stuff w/ the heart cut out and put it down, not anymore! Great color! That is so different looking! Oooh girlfriend! Such a great idea to use the fancy wood cutout thingy (that's the technical term) to cover the heart! love it! That is an ingenious idea! Love the color. I am lovin the aqua!!! This looks absolutely perfect. What a great solution. You're a furniture-fixer-upper-genius! Love it! So pretty color! So cute! 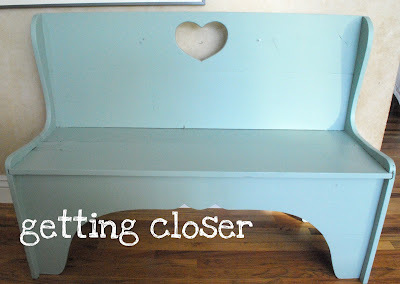 I love the color, and I think the wooden embellishments adds the perfect pop! such a great makeover...love that blue color!! never would have thought to cover the heart up - genius! I have two "country" style shelves/pegboards in my laundry room that are so out of date, but I use them every time I hang up laundry. We are about to redo that room and your great idea just inspired me to recycle them! Thanks!! Yay for ingenuity! It looks fantastic, perfect vintage vibe! That was a great idea and it turned out so nice! I think everyone had something wooden with a heart cutout back in the day. haha! 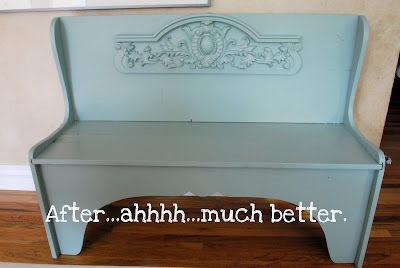 I love the bench now...fabulous!!! Love this transformation! I was wondering what you were going to do about that heart cut-out! Brilliant!